If I asked you to name just one Thai dish, it would be a reasonable good chance that you pronounce the letters P a d T h a i. It’s considered Thailand’s national dish, and is possible also the best known dish outside Thailand. If you’re inn for a plate, Thip Samai is one of the best in the business. Photo taken from street. the pad thai is made outside, but served inside. But let’s go back to the second world war where it all started. Or a few years before actually. Back to the nationalist leader of the military branch of the People’s Party, Field Marshal Plaek Rhibunsongkhram. He was one of the revolutionary figures, who in 1932 pushed Thailand out of an absolute monarchy and into todays fragile democracy, where coups and counter-coups have become the norm more than the exception. With the last one, still going on. Later on, between 1938 to 1944 and from 1948 to 1957, he also was the Prime Minister (or military dictator if you prefer) with a big influence of even todays Thailand. He also changed the name of the country from Siam to Thailand. And back in those days, wheat noodles were popular in Thailand, they where cheap, and Phibun (which is the western name of the former Prime Minister) sought to eliminate Chinese influence. His government started to promote rice noodles in order to establish a Thai identity, encourageing street vendors to make and sell it throughout the country. 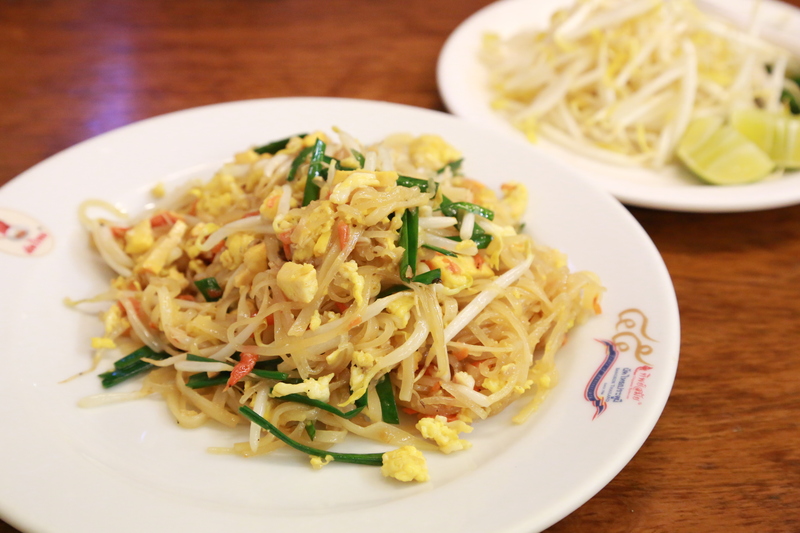 As a result, a new noodle named sen chan was created, a noodle very suitable to be stir-fried in a pan, and thats how a Thai noodle became pad thai. Pad means stir fried. And the receipt itself, is the result of a competition held back in the former days of Phibun. Queuing is a daily occurrence prime time. But don’t worry, it’s just a few minutes. Thip Samai is settled in an old neighborhood of Bangkok that has escaped the high rice and modern city you find most places these days. Banglamphu is the area. Maha chai is the street. 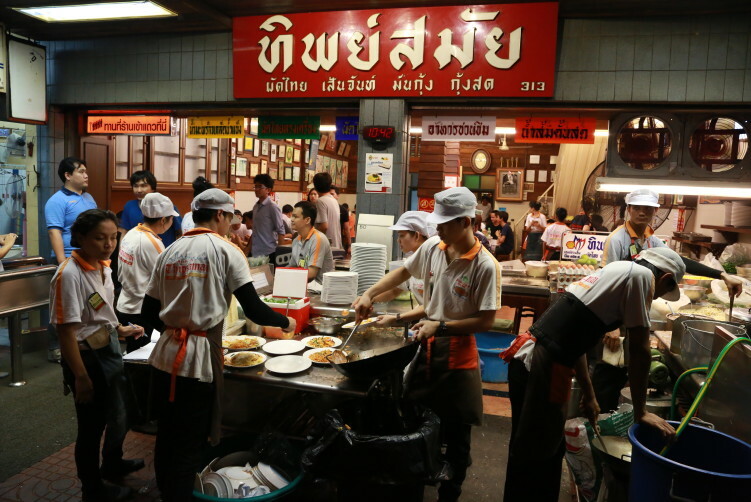 Thip Samai is probably the most famous pad thai resto in town, and their wok’s heated from the charcoal stoves street side never seems to get a rest, constantly delivering plates of Pad Thai for the hungry crowd filling up the room inside. Much more efficient than any fast food burger chain I have visited. And the cuing starts before opening hours. Plate of pad thai with tofu. The noodles are fried with bean curd, garlic chives, tofu, the small dried shrimps, before they add tamarind juice and palm sugar. And for your own choice, chillies, fermented fish sauce (nam plaa) and bean sprouts are available as add-ons. But the big secret for a successful version of Pad Thai is to be found in the sauce – the tamarind paste. You have fake tamarind and you have the real one. The rest is for you to figure out. Thip Samai have a menu of Pad Thai’s to choose from, including the most common versions with chicken or scrimp, but also a number of other combos. This time I decided to go for the original version, in other words, no chicken, no shrimp, and with tofu as the source of protein. It actually beats both chicken and shrimps as a protein source when it comes to pad thai. The original is a copy of the receipt as it was served back in the time of war. As soon as I get the plate, I go for my usual add-ons, including chili and vinegar. And it’s close to perfection, the ingredients just melt together to one juicy and lovely taste. Just as good this time as it was during my last visit a couple of years ago, and the visit before that. Thip Samai to the left of the quarter and Jai Fai to the right. 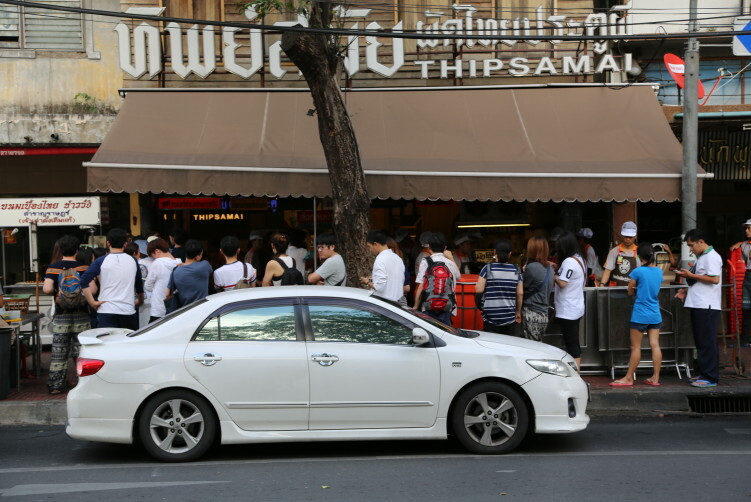 Thip Samai has become a bit of a hype, but you can understand why bankokians come a long way to eat here. It’s indoor seating, it has the reputation for one of the best in town and it’s priced fairly. But with the Bangkok traffic prime time, you need to plan unless you’re in the neighborhood. Be prepared to cue during rush hours. I had 20 people in front of me, but it took less than 10 minutes to get a table. The original cost B50. You pay a few bath more with other protein sources. The orange juice to accompany the Pad Thai cost 150 B per bottle (1/2 litre). You’ll soon realize that orange juice and Pad Thai is a fantastic combo, but also that you probably have tasted the best orange juice ever, with big chunks of meat. Be aware that it’s recommended to drink it the same day you buy it. Fresh! It’s three times the price of pad thai, and the price of the orange juice can be discussed, but not the quality. After my first plate I still had half a bottle left, so of course I ordered a second plate of pad thai. As always, it’s up to you to dress the pad thai with the condiments on the table. Personally some flakes of chili is always welcome. What I have difficulties to understand is why all the Khao San Road tourists order plate after plate of preheated pad thai from the many street vendors there. 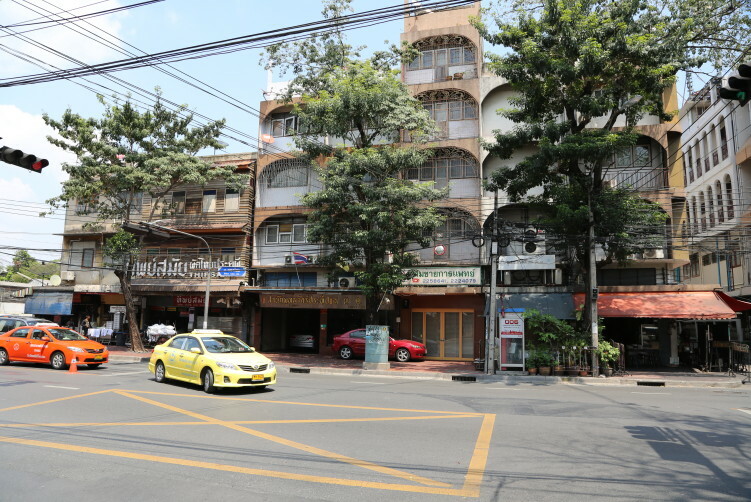 The difference in quality from Khao san Road to Thip Samai is enormous and Thip Samai is just a good 10 minutes walk away from the party street. And if you’re still hungry you have Jay Fai 70 meters down the road, if you have filled you’re pockets with Bath before you come here. You also have another one of Bangkok’s best pad thai places next door to Thip Samai where I recommend you to order the version with fat from the shrimps head. Absolutely marvelous and another ingredients that lift the dish from the ordinary plate of pad thai you find most places (also used at Thip Samai). To be honest, there is no need to cue at Thip Samai if you’re not a fan of orange juice. High rank foodies state that Thip Samai serves the best pad thai in the world. I don’t agree, but it’s one of the best, for sure. My personal favorite is Orawan in the Sri Yan area. A plain street stall, no fancy trills, no omelette wrapping, just a taste that is difficult to beat. 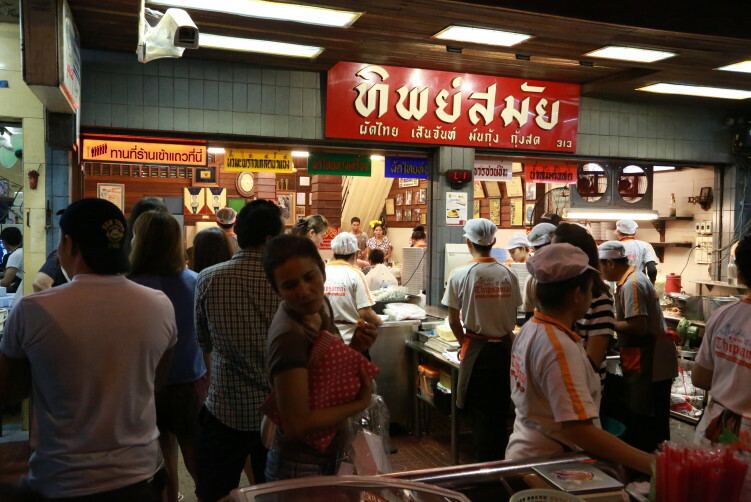 Another favorite is Lueng Pha Pad Thai next door to Thip Samai. Anyway, don’t skip Thip Samai, because it’s a really good choice, just no the very best in my view. http://rainypass.com/faq/ click here Price: B50 for the original. The version with another protein than tofu will bring the price a bit up. The wrapped omelets version with shrimps is B80. click here Open: Daily 5 p.m. – 3 a.m.
order now How to get there: It’s located in the old district of Phra Nakorn, just a few minutes walk from the Giant Red Swing near Chinatown Bangkok, and very close to the Golden Mountain. You can take the Khlong Saen Saep canal boat to the final Panfa Leelard station, exit towards Ratchadamnoen, make a left on Maha chai, and the restaurant will be on your left hand side. Alternatively, you can either take a taxi directly there or a bus. It’s also an easy 5 minute walk from Democracy Monument. Khao San Road is 10 minutes away. The real name isn’t of course The Golden Mountain. It’s formal name is Wat Saket Ratcha Wora Maha Wihan, usually shortened to Wat Saket. It is situated just outside the royal city precincts and next to Pom Mahakhan fort and has over time become one of the symbols of the city, and climbing up you get a magnificent view of the city. If you need another reason to get there, it’s in the distance of a gold mine of food vendors. The temple dates back to the Ayutthaya era, and when Bangkok became the capital, King Rama I renovated the temple and gave it its present name. 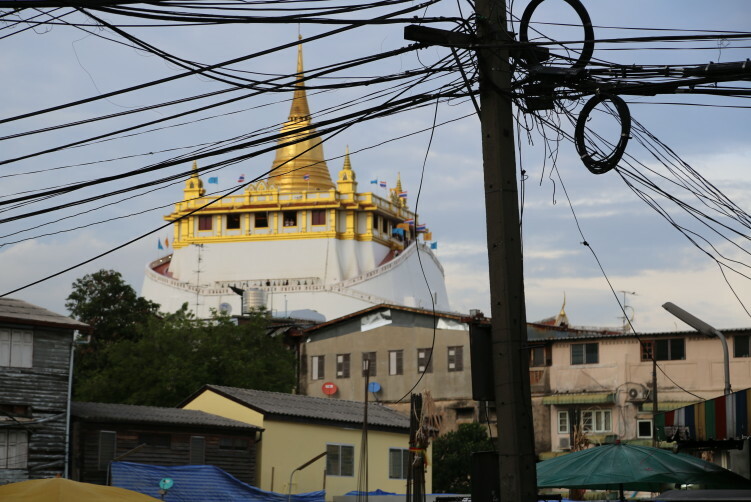 The Golden Mount at Wat Saket is built on an artificial man-made hill, and is also the temple’s most well-known landmark. It’s also a sacred pilgrimage site during the weeklong worshipping period in November. You need to climb the 344 steps that encircle the chedi to get to the top. The mount has a somewhat unusual history. King Rama III started to build it in the early nineteenth century, with a purpose of building a large chedi on the site to mark the entrance to the city. But the soil couldn’t support the large structure and it collapsed before completion. The next Rama in line, number IV, decided to build a much smaller chedi, housing a Buddha relic, on top of the mud and brick mound from the collapse. But it doesn’t stop there as Rama V decided to participate in building the structure. He rebuilt the pagoda towards the end of the nineteenth century. A relic of the Buddha was brought from Sri Lanka and placed in the chedi. The surrounding concrete walls were added in the 1940s to stop the hill from eroding. The modern Wat Saket you see today was built in the early 20th century of Carrara marble. Although the top of the mount has been encased in concrete, the base is still a jumble of bricks and plaster overgrown with trees and bushes. You will see numerous plaques and shrines with Buddha images to pay respect to departed people from vegetarians living in the area. The reason might be that in the late 18th century, Wat Saket served as the capital’s crematorium and the dumping ground for some 60,000 plague victims. Anyway, when approaching the top, don’t forget to take note of the wall of bells and panoramas of historic Bangkok. Also, don’t forget the 360 degree panoramic view of the city from the rooftop terrace. You see the Temple of the Emerald Buddha at the old Grand Palace to the west. You will also see the tips of the Democracy Monument and the peaks of Wat Ratchanadda. The Rama VI bridge with its golden threads of suspension cables can be seen to the northeast. The tall towers of the business district is to your east. The best time to visit the temple is during the cool season from late November to January when the frangipani trees around the base are in bloom with a wonderful jasmine-like scent. Admission: 20 Bath for foreigners to enter the building and to access the roof top terrace. Free entrance for Thai people. Best time to visit: In November during the blooming of the frangipani trees. November is also the time for the enormous annual temple fair, Loy Krathong, at Wat Saket, featuring a candlelight procession up Phu Khao Thong to the chedi. During this week it’s open until midnight. How to get there: Best way is Taxi if coming from down town or to take the river taxi not to far from MBK Shopping centre. Take the Chaophraya Express Boat to the Memorial Bridge pier. When you excited the pier turn left and left. You’ll see the temple from there. A walkable distance.